The co-founders of InterOcean Advisors, Bill Doepke and Bob Wujtowicz, have worked together continuously since first teaming up in the mid-1990s at Ernst & Young Corporate Finance (“EYCF”). At EYCF they were senior leaders of the Automotive, Metals and Building Products practice groups. Previously in their careers they advised a diverse group of industrial companies. In 2004 EYCF was acquired by Giuliani Capital Advisors LLC (“GCA”), a full-service investment bank. After two successful years with GCA, Doepke and Wujtowicz decided to leverage their extensive industrials experience and create a boutique investment bank exclusively serving the manufacturing sector. 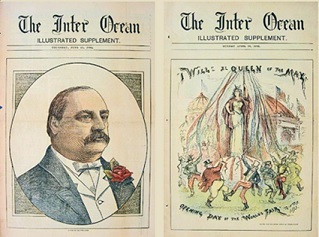 Published in Chicago in the late 19th and early 20th centuries, The Inter Ocean was a daily newspaper with a pro-American industry stance. With the advent of the transcontinental railroads, it became possible for newspapers to be distributed by mail throughout the central and western United States, and The Inter Ocean became a definitive source for news for businesspeople throughout the American West. Eventually, The Inter Ocean was merged into the Chicago Herald-Examiner. In today’s increasingly interconnected global community, the InterOcean name is more meaningful than ever. Not only is it reflective of our Chicago business heritage and commitment to the industrial sector, it also underscores our ability to deliver quality investment banking solutions to clients with geographically diverse needs—whether in the United States or around the world.